Companies from the energy sector can no longer improve on best practices. There is a strong need for a new sustainable strategy that will optimize old operations and address the challenges from the renewable energy. Examples of the Key Performance Indicators that can be used. PwC in their Global Power & Utilities Survey 2015 interviewed 70 senior executives from power and utility companies all over the world. Most of them (97%) agree about the significant market disruption by 2020 and anticipate (73% of the interviewed executives) major business model transformation. Companies like IKEA, Walmart, and Apple have switched to the renewable electricity and are focused on reducing their carbon footprint. And there are even more ambitious projects, like powering Munich, a city with over 1.3 million population with green electricity by 2025. Sustainability. Optimizing current operations, where the main trend will be about reducing the environmental impact, particularly focusing on the low-carbon energy systems. Renewable Energy. Working on new energy technologies that are more sustainable from the environmental and economic points of view. A good example of such an approach is Pacific Gas and Electric Company (PG&E), which recognizes a fast changing environment (a wide spread of solar power and electric vehicles in California) and sees their role in investing in the underlying infrastructure. This is an excellent way to address the distributed generation challenge. Another example is India’s largest power company, Tata Power. While optimizing their coal-based production, they are investing in distributed energy resource systems and various technologies for a generation of renewable energy. New players, in some sense, are in a better position, as they have an opportunity to build their strategies from scratch with no need to support legacy technologies. For example, Tesla Energy sets an ambitious goal to enable a zero emission power generation. Thinking about these changes in the format of the Balanced Scorecard strategy execution framework, we can focus on these directions. Energy Scorecard online - sign-up with a free account for immediate access to 16 scorecard templates. Here, we can map the expectations of the business’s shareholders. You might also want to track revenue that is generated by energy produced from fossil fuel and renewable sources. For example: create a product that reduce energy costs. This goal belongs to the “Sustainability” theme as it was described above. For example: reducing their carbon footprint. This goal belongs to the “Renewable” strategic theme. In the “Internal process” perspective we need to map the goals that will ensure achieving the goals specified in the Customer perspective above. Downstream (manufacturing, transportation, and supply). Finally, in the “Learning and Growth” perspective an organization needs to shape their learning directions. As you can see, not all of the goals have indicators aligned with them. You can use our KPI system to find more specific indicators that will be tailor-made for your organization. 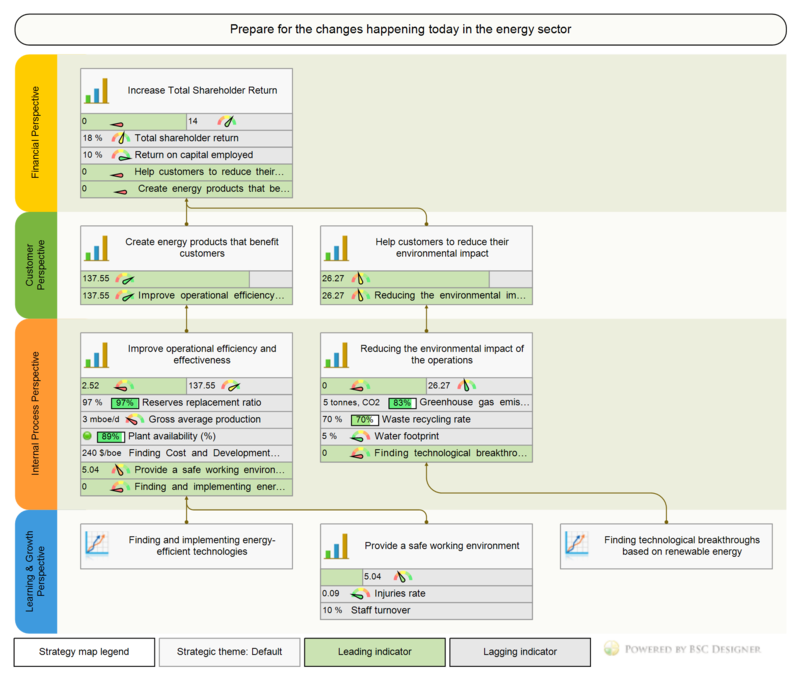 The strategy map that we showed in this article was produced with BSC Designer software. You can use this template and customize it for your own needs. It is available in the cloud-based BSC Designer Online (check it out online now), as well as .BSC project file for BSC Designer PRO. The landscape of the energy industry is changing rapidly. 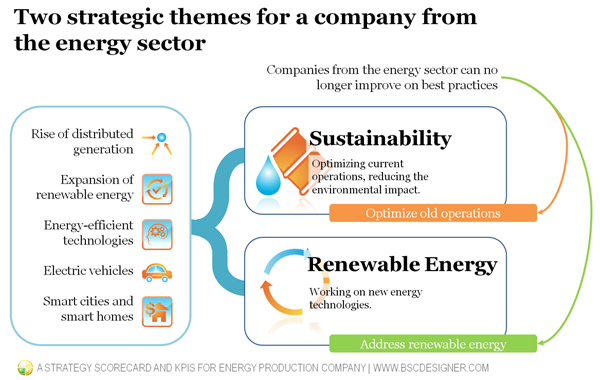 The energy companies are now in a transitional period and have an opportunity to become more sustainable with old operations and also add new renewable technologies in their service portfolio. Having a well-designed strategy map is an excellent way to communicate a new sustainable strategy to the employees, customers, and shareholders. What do you think about sustainability as a strategy for energy companies? Do you have some positive or negative examples? Feel free to share your thoughts in the comments. Energy Scorecard discussed in this article as a starting template for your own scorecard! ^ TATA POWER: Lighting up Lives!